(Bihar Times) For years now , I have been advising people not to eat meat. Apart from all the other things wrong with it, very few people know which animal has been killed for its meat, its state of health when it was killed ( 45% of all animals killed in slaughterhouses and 70% of all chickens have gangrene when they are killed as their bones have been broken while being transported , the tissues have started decaying and have become smelly, bacterial infections have set in, the flies have laid their eggs in the pooling blood, blood has turned poisonous for several days, the acidic levels have risen and there is a gas build up, the body has already started rotting much before the animal has been killed. ) and the way in which it was killed ( in an investigation report of the main slaughterhouse in India , Idgah in Delhi, placed before the Supreme Court it was shown how the animals were cut with rusty blades, urinated and defecated on and left in pools of other animal But this article is not about the filth in meat that no amount of boiling can take out ( can you boil gangrene of human faeces out ? ) It is about the type of animal meat that you are eating. The Bihar government has just announced that it will promote rat meat. This is one state that has been looted so systematically and ruthlessly for the last 15 years that it has no middle class or rich people left at all. In 15 years of Lalu Prasad’s shameless dacoity, no roads were built, no hospitals or schools made , every single industry fled , most shops closed down. Even the politicians became scroungers ! The only people who got rich were the criminal mafia who cornered all the natural resources like coal and iron ore and , with the help of Lalu Prasad and his illiterate wife whom he made proxy Chief Minister while he stayed under house arrest for corruption, took it out of the state. The new government has been further crippled with huge floods and inefficient administrative abilities. So now, they look for quick fixes to bring prosperity. For a while they jumped enthusiastically into smuggling cows out to Bangladesh to be killed for meat. But now there are very few cattle left and the farmers dependant on them for ploughing are even more destitute. So now what better than the only natural resource left – rats. 1. Rats eat more than 50 % of the grain in all the leaking , badly kept government godowns. If these are caught , then the grain will be saved. 2. The community of Mushars will be socially rehabilitated and will become rich. 3. Everybody will have a source of protein. This will solve the global food crisis. India has, according to the bureaucrats who have no doubt done a population count with NGOs of their relatives and charged the World Bank for the same , eight billion rats , seven for each Indian. ( Bureaucrats number eight per Indian and would be just as nutritious to eat. In fact getting rid of them would probably solve every world crisis). Bihar’s social welfare department secretary, Vijay Prakash, was quoted in The Statesman, as saying: “Rat meat has huge potential to be developed into a popular dish which, if extensively commercialized will tackle almost 50 per cent of the food crisis in the country”. He said that his department plans to organize food festivals, set up stalls at various locations to sell rat meat and train hotels in ways of making tasty rat meat dishes. 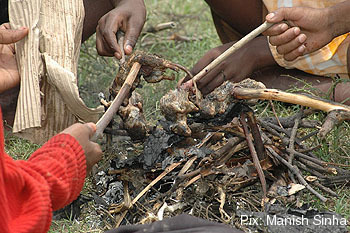 “Many of the reputed hotels in foreign countries have rat meat as an important part of the menu. We will interact with these hotels to teach us how to adapt our cuisine to this meat. We intend to make it a household item very soon here”, he said. The social welfare department plans to popularize rat farming on the lines of chicken and fish farming. Some field rats weigh as much as three kilograms and if a poor rat-catcher can nab three or four rats a day and sell the meat , he could lift his family out of poverty, Prakash told the daily. At least Bihar is being honest about their intentions. Rat, dog and cat meat are the staple animals used in most meats served by many restaurants across India. Mince balls, patties, kebabs and other over spiced meats hide and confuse the consumer. In South India , according to the Bihar government , rat eating has always been popular and has in fact lowered the demand for chicken. In North India , according to him , it has always been eaten. In Bihar it is known as patal Bageri. 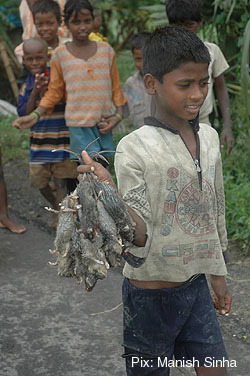 The rat catchers sell the meat for Rs 5 per rat and as each rat is at least 2 kilos , the motel owners charge Rs 30-40 from their customers – depending on what meat they say it is. Twenty years ago, we were told that Polish rabbit farming would solve the meat problem. Rabbit farms were set up in West Bengal and Himachal Pradesh and by now , they have run into the ground with the animals dying of starvation and disease and escaping into the forests where they have destroyed a large amount of natural habitat. Then we were told that emu meat is wonderful and emus were smuggled in to Andhra Pradesh and Karnataka from Australia and have proven to be big failures except in the clandestine meat market where they are sold as duck and chicken. Ducks and turkeys are still too expensive for their meat to act as substitutes for chicken,mutton or beef. And why should they be sold cheaply to the motel market when dogs , cats , rats, mongooses and squirrels can be caught for free and killed. Now that rat meat has been made official, I suppose there is no difference between the rotting flesh of one animal or another. Goat, pig, cow, buffalo,frog,monkey,snake,fish,crocodile - the pantheon of victims expands to include all species. I am just waiting for cockroaches to become the national dish. And then there will only be humans left. Actually I haven’t seen many rats around lately. I wonder where they went. I read the response of the people and fail to understand that why people are counting Maneka ji as a part of Gandhi family? She has never been a part of our omnipotent Gandhi family and is not even at talking terms with Rajmaata Sonia Gandhi as far as I know. Maneka ji is true Indian and has Gandhi surname because of her late husband. Please get your facts right. Her son is an MP from BJP and she herself has not been a part of Congress (I). If you read her columns regularly, you will find a serious and genuine person in her not the selfish and conceited person like rest of our political lineage. I agree that sometimes she goes overboard with her animal rights campaign but I strongly believe that no one can deride her willpower or awareness. We have thousands of Netas who call themselves working for human rights and welfare but their deeds defy demons so what is wrong if one of the leaders is working for animal rights? Human race is not the sole proprietor of this planet earth, we share this planet with other species and we need someone to care for other elements of nature otherwise our future generations will have to see Tigers and Bears only in pictures. Are all my Maneka-bashers ready for that future? Do not you wish that you would have seen Dodo or Dinosaurs in real life? Thanks. "This is one state that has been looted so systematically and ruthlessly for the last 15 years that it has no middle class or rich people left at all. In 15 years of Lalu Prasad's shameless dacoity, no roads were built, no hospitals or schools made , every single industry fled , most shops closed down. Even the politicians became scroungers ! The only people who got rich were the criminal mafia who cornered all the natural resources like coal and iron ore and , with the help of Lalu Prasad and his illiterate wife whom he made proxy Chief Minister while he stayed under house arrest for corruption, took it out of the state." Either Mrs Gandhi is trying to be innocent or she has assumed us to be innocent. I think people is Bihar have begun to understand who have systematically and ruthlessly looted Bihar after independence. It has been anti-Bihar gov. at the center run by the congress party, headed by the Gandhi family. Leaders like Lalu are just side effects of the central gov. apathy towards Bihar. Lalu Prasad Yadav may not be as good as Nitish Kumar for Bihar, but never the less he is not anti-Bihar. How could mafia corner all the natural resources like coal and iron ore..! they wouldn't have even place to keep a part of it. Isn't Bihar a colony of the central government? The power has shifted from British gov. to our central gov., which controls much of the resources. Thanks to those evil regionalist-casteist people in the Planning commission. Only if you would have spent your energy giving more priority to human beings in Bihar and fought for them 1st, instead of the animal kingdom. Lots of leaders have been coming to Bihar to do experiments and use it as a launch pad. I do appreciate the genuine concern you have raised. Why to save only COWS not rats. Government promoting to kill rats, somebody also worships them. log inke pariwar ke piche keon parhe hue hain? (joke tha jee).